Turia Pitt Everest Base Camp trek will raise funds for Interplast. Turia Pitt heads to Everest for fundraising trek with Interplast. The opening lines of Turia Pitt’s second memoir, Unmasked, is an emotional and poignant start to a story of incredible strength and determination. The chapter opens on the morning of September 3, 2011 as Ms Pitt prepared to run a 100-kilometre ultramarathon through the Kimberley in Western Australia. Twenty-five kilometres into the race, Ms Pitt and five other runners became trapped by a raging bushfire in a gorge. 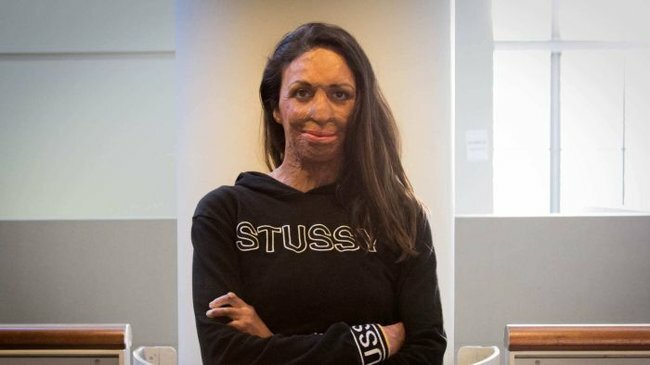 She suffered burns to 65 per cent of her body. “I remember looking down at my and hands and arms and seeing them both ablaze,” Ms Pitt said. But while the event made headlines, and her recovery since and numerous media reports have kept her in the spotlight, she is determined that those two minutes will not be the most important event in her life. “I’m all for revisiting the past if it’s going to make my future better,” Ms Pitt told ABC Radio Sydney. The memoir also includes the perspective of those closest to Ms Pitt, including her friends, her parents, fiance Michael and his parents, and her surgeon Professor Peter Haertsch. While she has been making the promotional rounds for her book for the past month, what Ms Pitt is otherwise focused on at the moment is her upcoming trek to Everest Base Camp. She is leading the trip next week as an ambassador for not-for-profit organisation Interplast. Interplast sends teams of volunteer plastic and reconstructive surgeons, and medical and allied health teams to provide life-changing surgeries and medical training to countries in the Asia-Pacific. The trip from May 10 to May 28 will also involve visits to local hospitals in Nepal where the group will see the charity’s work firsthand. “I like walking and fitness,” Ms Pitt said when asked about training for the trip. “We’ll get an insight into what Interplast does, which is really cool because the other trips I’ve done we haven’t been able to do that. And this trip will add just another adventure to Ms Pitt’s portfolio. Within a month of her accident, Ms Pitt wrote in her book that her resolve to compete in an Ironman race “was starting to harden”. In 2016, she ran two Ironman races including the world championships at Kona in Hawaii. She has also led other fundraising treks for Interplast including across the Great Wall of China, the Inca Trail to Machu Picchu, and the Kokoda Track last year. Her motivation for the trips is simple: “I look forward to it and it makes me feel good”. Ms Pitt has undergone more than 200 operations since the fire and had to learn to walk and move again with her new body. Professor Haertsch said that when Ms Pitt first arrived at Concord Hospital a couple of days after the marathon, she did not have “survivable burns”. “It was one of the deeper burns I’ve ever dealt with in my career and I didn’t think she’d survive it,” he said. “The first step was that we said she’s an elite athlete and she’s young, so we shouldn’t just shut up shop, we should do our very best to see how she would respond to the treatment. The turning point was when Professor Haertsch was able to secure donor skin from America and applied it to 40 per cent of Ms Pitt’s body in a surgery she describes in the book as the “critical turning point in my recovery” and the reason she is here today. Professor Haertsch is also a volunteer with Interplast and it was his trips with the organisation throughout Ms Pitt’s rehabilitation that encouraged her to become an ambassador herself. “That really galvanised me and inspired me because I thought Peter Haertsch, this incredibly talented, skilled man is dedicating his time to help others and I want to do something as well,” she said.